Today I want to Share my Journey of Winning a Car from site Adytude.com . I am very active in participating in contests and giveaways as it gives lots of happiness and fun . Past 4 years I had participated and won many facebook contests and blogs giveaways . Its a good time pass for me as I do not watch TV serials as I cannot follow useless serials for years , watching all negative stuffs . So for me my source of entertainment is internet , writing posts for my blog , participating in contests and giveaways , and when I win and get some good stuff that makes me happy and content that I have utilized my free time in a good way . I randomly search many thing on net , I am a member of many sites and forums . I constantly try new and different things and stick to ones which are interesting . So last year on face book I saw Adytude.com’s page . The concept was very simple , Rating and Reviewing Ads . I thought I can do this easily , since I am a blogger I can write some good reviews . I joined the site and started reviewing the ads . A member has to review only two ads per day and some points are awarded for that . When that point gets accumulated one can redeem some gifts from their Reward store . Their Reward store is too good , I got some Amazon.in vouchers and some other gifts from there . I was very active on that site , I used to login daily and review ads , I always wrote good reviews . I wrote what I felt about the ad , good and bad both . Its like what the viewer feels about the ad and how it can be improved or made better . I always do my work with passion , put my Heart and Soul in it . Try to make it The Best . So there also I did the same . I had joined Adytude.com in October 2015 . After four months at the end of January 2016 , one day I got a mail from their team that I have been chosen as the one of the Best Performers . That was a great thing for me , getting recognized for my work . Then after few days again I got a mail that I am among Top 3 Performers . I am eligible for winning a Car . I was so happy but still not sure that I can win a car , that’s a big thing . So i did not discussed this with any one , not even with my close family members . They asked me to send some documents , for KYC ( Know Your Customer ). Scanned copy of my passport , Pan card etc . I send that all to them . 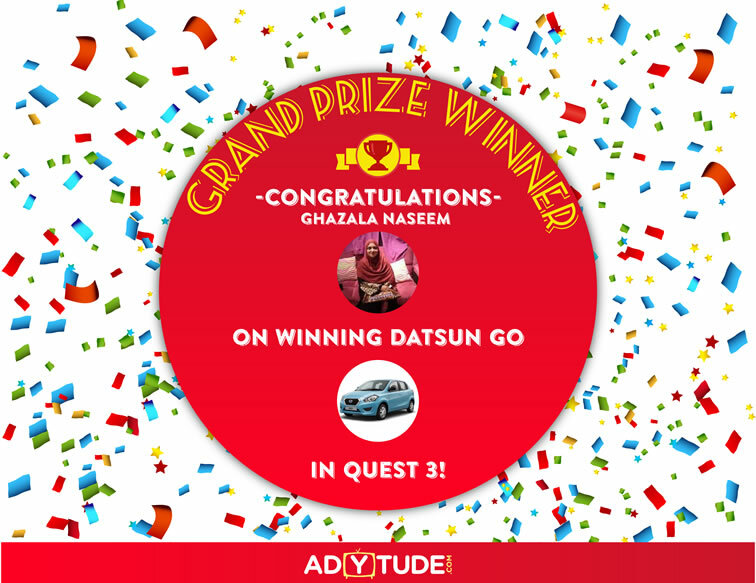 On 1st February 2016 , in the morning i got a mail from them that I have been chosen as the Winner of Grand Prize , a car , Datsun Go . I was so happy and excited that I could not understand what to do ? 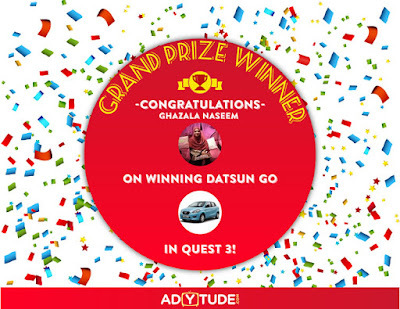 Then I checked the facebook page of Adytude.com and saw my Photo there as Grand Prize Winner . Before I could understand and accept that such a big thing has happened , this news got viral on facebook , my friends and relatives started congratulating me . It really took some time to accept that this has really happened. My kids were more excited then me that mama has won a car . This is the image that as posted on their page that day . That excitement continued for many days , got calls and messages from near and dear ones . And after that their team contacted me for further proceedings , paper works and all . They said this will take time as lots of paper work is involved . I did what they said . First choose a car dealer in your city from where you want to get that car .Then choose a car . Then they send me some legal documents to be signed by me and the dealer . This whole process took some 4 months , which was a long period , at times i used to feel irritated that its taking so much of time , but I had no other option but to wait . 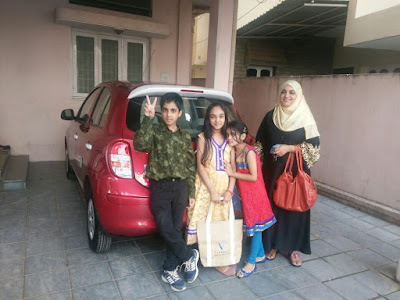 At any point of time i did not had a doubt that i will not get my prize , I was 200% sure that i will get as i am the winner of Quest 3 of their site , before me two other persons had got car from the site . But the waiting time was too long . Finally when every thing was done i told them to close this before the Holy Month of Ramzaan as it would be difficult for me to visit the showroom again and again in Ramzaan . So finally just a day before Ramzaan they decided that the Key Giving Ceremony will be done . A representative from their team would come to the showroom to hand over the keys to me. 6th June was decided as the D Day , I got the number of their Representative and talked with her , she said she will be at the showroom at 3 PM , we also reached there that time . And the keys were given to me with lots of good wishes . My kids were Super Excited and it was a Golden Moment of my life . I would like to thank the entire Adytude team for choosing me as the Best Performer and giving me a chance to win a car . 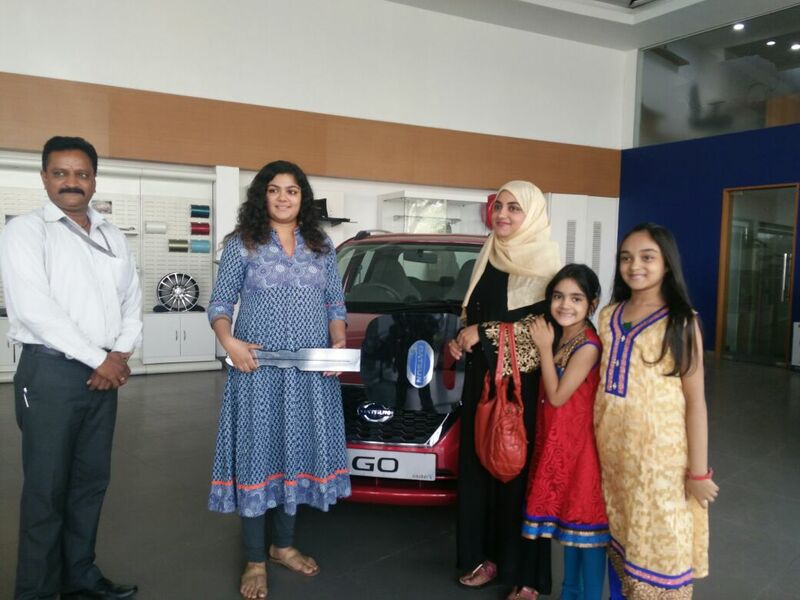 I would also like to thank the employees of Datsun Showroom at Hitech city , Hyderabad for being very cooperative . For my Readers and friends , I am sharing this experience with all so that others can also get inspired and try their luck at Adytude.com and many more such contests , we never know what Great Things and Opportunities are stored for us by the Almighty .